The way I teach is all-inclusive, not just for people who are fit, flexible and quite strong already. I want to offer an environment which is non-competitive, easygoing, spacious, meditative and accessible for everyone. I’ve been practising and teaching yoga for more than 30 years and I am familiar with many styles and aspects of yoga. I hold an Iyengar Yoga Teacher certificate and a Senior teacher certificate with Dona Holleman who was a close student of BKS Iyengar. ‘Yoga Body of Light’ has it’s foundation in the precision and vigour of Iyengar Yoga but emphasises more on breathing and the body’s natural flow of movement. Learning the body’s anatomy and how to move from within, the body is seen as an energy field interacting with nature. Remembering the pure joy of body movement we come back in touch with our true inner potential and happiness. How far we take this inner journey to freedom, is unique to each individual. My interest in yoga started in the 70’s when I was involved in a project with Autistic children in Berlin. The children became my teachers. We gradually bonded through bodywork, music and love. Reading my first book on meditation ‘Hara’ by the philosopher and psychotherapist Graf von Dürkheim when I was 29 I decided to go on a journey, which became my life’s journey. I had my first meditation and yoga experience in a mud hut in South India. It was a significant turning point in my life. I moved from Berlin to England, lived there for 10 years in a Buddhist community and trained as a Yoga Teacher at the Iyengar institute in London and travelled several times to Pune to study and practise with BKS Iyengar. I realized very soon that just the practice of yoga asanas (postures) was not enough for me. To have a deeper understanding of life and how the yoga practise works, I needed spiritual teachings to reflect on. In my early travels to India I stayed at the Ramana Maharashi Ashram in the South of India which had a profound effect on me. I spend several times in Auroville, teaching yoga and studying the teachings of The Mother and Sri Aurobindo. My practice is inspired by the ancient Yoga Sutras, the teachings of Advaita Vedanta, Buddhism, modern psychology and quantum physics . My emphasis is and has always been the path of the heart, direct experience and a down to earth truthfulness. I don’t follow one particular yoga school or teacher, because I know that the true ‘Guru’ is within our own hearts. I call my style ‘Yoga Body of Light’, a journey into the more subtle body, the body of breath, energy flow, prana, transparency, lightness and joy, using the classical hatha yoga asanas to connect with that within us, which is beautiful and in harmony: the body of light. My teachings are always changing and directly from my heart experience, often very spontaneous and unpredictable. I am inspired by many well known Yoga teachers of my generation. I feel particularly grateful to Gita Iyengar’s solid teachings of alignment and vigour, Angela Farmers creative and feminine approach, Orit Sen Gupta’s Vinyasa flow and philosophy, Dona Holleman’s pioneering, strong and clear practice and wisdom, Vanda Scaravelli”s teachings of “undoing the body”, Sarah Power’s beautiful way of combining “Yin Yoga” with Buddhist insight teachings and Swami Veda’s gentle and subtle teachings of the Himalayan Yogis. In my later years I spent several times in the Himalayas, deepening my practice in yoga, pranayama and meditation. I visited several ashrams and monasteries, went on solitary retreats, silent retreats, meditated in caves, forests and on mountain tops, faced my fears on many levels and became may be not much wiser but more humble and compassionate. For many years I studied with Swami Veda Bharati the ancient teachings of the Himalayan tradition and went on retreats at his Ashram in Rishikesh. I am a devoted follower of Mooji’s non dualistic Advaita teachings as well as Dilgo Khyentse Rimpoche, a master of Tibetan Buddhist teachings, especially the non dualistic direct teachings of Dzogchen. I have been teaching now for more than 30 years, I’m 65 years old. I will never stop seeking since I realised that life is about inner growth, self inquiry and a gradual awakening to higher dimensions of life, to one’s own essential nature. Yoga is the most challenging, most revealing path we can choose, if we practice it in all it’s aspects. NOT Saturday 1st June – no Meditation Afternoon! 6.30pm general yoga @ Body of Light E2. Book via text message. 7.45pm Yoga flow for students with some experience @ Yoga Place E2. Book via Yoga Place or drop in. 1pm general yoga @ Yoga Place E2. Book via Yoga Place or drop in. 8pm women’s recuperative yoga @ Body of Light E2. Book via text message. 9.30am Yoga in Victoria Park (from April). Just drop in! Approximate location of Yoga Body of Light E2 classes. Yoga Place, Bethnal Green Road, E2 classes. This year we are going on a small remote greek island Folegandros, 40min Ferry from Santorini. The retreat is going to be deeply relaxing and nourishing practising by the turquoise mediterranean sea. A place to take plenty of deep breaths! We start in the morning at sun rise with sun salutations and meditation. There will be another morning and afternoon yoga session and meditation in the evenings. There will be time to go swimming or simply relax on the beach, draw, write or paint or read a book in a quiet shady place, going on boat trips or walks, or just resting and eating fresh Mediterranean food. I have a whole range of private students. I’m working with people with back problems, cancer, depression, panic attacks, chronic fatigue, Parkinson decease and with people in wheel chairs or with stress-related problems as well as with those who simply want to keep fit and healthy. My teaching is completely intuitive. 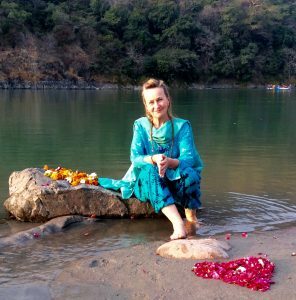 I integrate into my yoga teaching the knowledge of Ayurveda, Pilates, Holistic, Therapeutic and Thai massage, chanting, Tibetan singing bowls, Reiki healing as well as breathing techniques. I do home visits or you can come to my home studio.